Scientists can now identify the exact location of a single atom in a silicon crystal, a discovery that is key for greater accuracy in tomorrow's silicon based quantum computers. It's now possible to track and see individual phosphorus atoms in a silicon crystal allowing confirmation of quantum computing capability, but which also has use in nano detection devices. Quantum computing has the potential for enormous processing power in the future. Current laptops have transistors that use a binary code, an on-or-off state (bits). But tomorrow's quantum computers will use quantum bits 'qubits', which have multiple states. Professor Lloyd Hollenberg at the University of Melbourne and Deputy Director of the Centre for Quantum Computation and Communication Technology led an international investigation on the fundamental building blocks of silicon based solid-state quantum processors. His collaborators Professor Sven Rogge and Centre Director Professor Michelle Simmons at the University of New South Wales, obtained atomic-resolution images from a scanning tunneling microscope (STM) allowing the team to precisely pinpoint the location of atoms in the silicon crystal lattice. 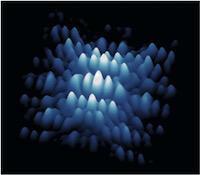 'The atomic microscope images are remarkable and sensitive enough to show the tendrils of an electron wave function protruding from the silicon surface. The theory is now visible, this is a world first,' said Professor Hollenberg. In 2015, the Centre for Quantum Computation and Communication Technology was included in the Prime Minister's Innovation and Science Agenda — a significant undertaking by the Federal Government also supported by a combined $20m investment commitment from Telstra and the Commonwealth Bank.